Updated 9/07/17 - Currently no job openings at Mulberry Tree Preschool in Moraga, CA. Knowledgeable and respectful teacher to help provide children with a nurturing environment that promotes positive self esteem, and a curiosity for learning.Responsible for supervision of children, planning and implementing curriculum, and working with parents. This position includes both individual and team teaching. 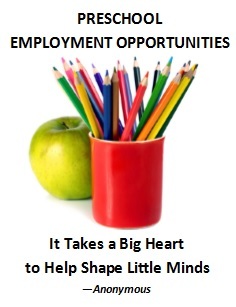 Requirements: 12-15 units of early childhood education and head teacher experience.